It has been a week since Episode 9 of Te:RaSeh! 2.0 was aired, but the high entertainment and humour aspects of that particular episode are still fresh in my head. I think it just edged the seventh episode as the most entertaining of the series thus far. The theme for the night (Horror), ensured that whatever costumes or make-up the contestants put on, were sure to tickle our fancy and scared those with faint hearts. Put in each contestant and how they immersed themselves in their respective characters, it was a laugh-a-minute fest that had people like me and my kids watching the re-runs and still laughing at the jokes days after. I personally feel that Fauzie Laily deserved the Celebrity-of-the-Match award as he was in character (dead World War II Japanese soldier) throughout from start till the cameras stopped rolling, and all the way, even after the show had ended. 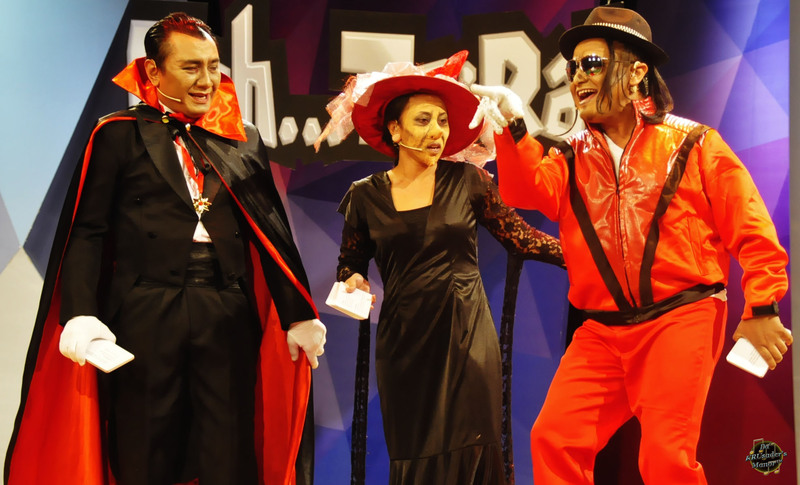 I will not begrudge Azlin Ali as she too was also a deserving winner in her role as Makcik Keropok, when she appeared onstage at the start of the show munching on the Papadam in her hand and sharing it with the rest. When Danial Ashriq (Chucky) did his somersault from the stage during the Final Face-Off (Te:Ra! Habis – Boria), Azlin responded in kind by jumping off the stage and treating the already-bewildered audience with her own dance moves. I thought there and then that she was to be anointed the Celebrity-of-the-Match for tickling our bones with her antics, and I was not wrong at the end of the show. For the record, Azlin joins Suzairhe Sumari as the only two celebrities who have won the award twice throughout this season’s competition. No mean feat, but it is also testimony to how good they were in their respective roles and characters given to them by the producers of the show. It was also a good show as it put everyone at the edge of their seats and willing each team on to win. It was nervy, not only for the contestants but to the watching audience in the Mediacorp TV Theatre, as well as those at home. I felt that the fight between both teams were so close, anyone could have won it. Going towards the Final Face-Off (Te:Ra! Habis – Boria), both teams were separated by just ten points, with the Mats leading by that slender margin. In terms of showmanship, prose and creativity in delivering their lyrics, I felt the Mats edged the Minahs slightly, but with a guest judge who openly showed her support to the Minahs right from the first quarter of the show, I felt it was a losing battle for the Mats no matter how hard they tried and how good they were. I would like to believe that the show of support was deliberately done to shake the confidence of the Mat and dealt them a psychological blow, but no matter how I look at it, it’s not good viewing even for a show of this fun nature. No, I am not saying the guys deserved to edge that last segment just because I’m a guy, but I think if we were to throw aside the bias and be more rational, we’ll agree that the guys showed better creativity when delivering their lyrics. Even some of the Minahs I spoke to post-show, agreed that the guys did slightly better. This is where I hope the Grand Finals tomorrow will be a fair affair. We already have two resident judges who represent each gender and can get away with the bias, though to their credit they have not been showing it so blatantly these past nine weeks. It’s the guest judges who hold the wild and trump cards. We could do without a repeat of last year’s mini-controversy whereby some of the guest judges showed whose side they were on. A judge has to be impartial afterall, even if this is a fun competition to begin with. One can show their quiet / gleeful support for their favourite teams via their votes during the Face-Offs, but not through openly-blatant display for the whole world to know. It somehow kills the spirit of competition and demoralises the other team, resulting in quiet discontent. Though I am a bit disappointed with that particular aspect, I am still pleased to see the Minahs closing the gap as I had earlier predicted. Going into the Grand Finals tomorrow, from what I understand, the winner will win double the points, which means if the Minahs were to win, they would eventually leapfrog the Mats and end up being the dominant gender, not to mention the overall winner. As the score stands, the Mats are leading 5:4. With so much at stake for tomorrow’s Grand Finals, we’re going to see all the contestants giving their all in the special two-hour show. It’s gonna be another heart-stopping affair with the line-up ensuring there will be a good mix of contestants with differing abilities, capabilities and personalities. The Minahs will be represented by Nurul Aini, Huda Ali, Syirah Jusni, Azlin Ali and Nurfarhana M Noor. The Mats will have Suzairhe Sumari, Fauzie Laily, Fadhlur Rahman, Danial Ashriq and Hafeez Glamour fighting in their corner. Before I end my entry, I would just like to commend Wawan Husen from Auraz Band for being the best Celebrity DJ throughout the nine weeks, at least from my personal standpoint. He did so much better and was so fluent as compared to some others who looked a little lost and unfocused, which resulted in some of the contestants and audience wincing and lamenting afterwards about points lost during the Q&A segment. For his reward, I believe Wawan will be back for another round tomorrow. Another three that did well so far and caught my eyes were Ashmi Roslan, Ryan Sufiyan and Shikin Imran. Not too sure though how many will be allowed in the radio conty tomorrow. But what is more important is that, I am hoping for a clean, fun, entertaining and fair fight from all contestants as they not only entertain us with their antics, but also channelling all their efforts for a good cause, winning points and monetary proceeds for their respective charity beneficiaries. I wish all the contestants all the best and play safe!! !